Fall will be here in a bit less than a month but already no one's thinking about summer anymore given that class has started again. BUT ! I have three little things here that will keep your skin summering. 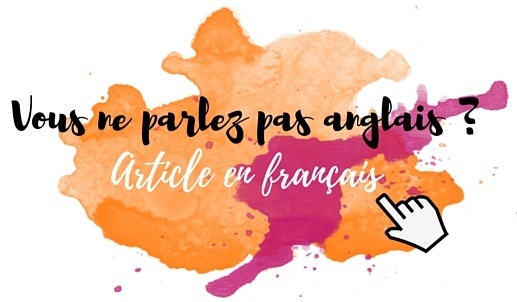 It seems like a long time since I last wrote about Equivalenza, I think the last time was with their Vanilla Body Mist. It's not like I don't have any more of their products to show you : I still have to talk about their hand creams with 5 different scents among which Miami Pink Flamingo and Polynesian Experience. 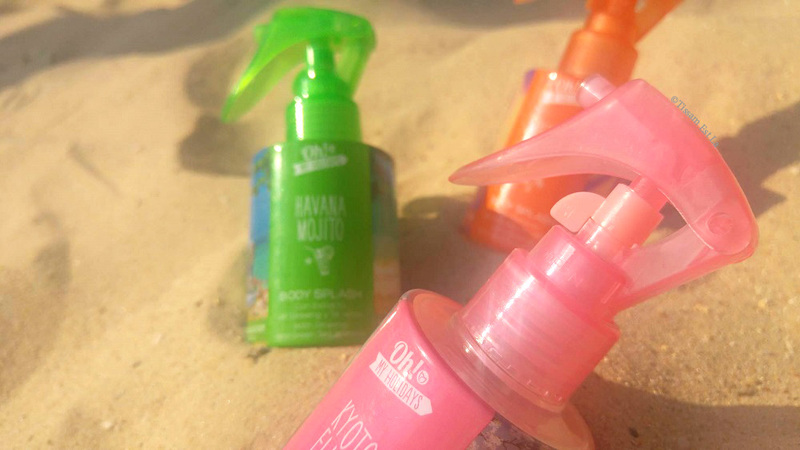 So today will be about three body splashes from the Oh ! My Holidays range I've bought during the Summer Sales with a Buy 2 Get 1 One Free : Havana Mojito, Dreaming Hawaii and Kyoto Elixir. Oh ! My Holidays is an Equivalenza range that focuses on travel and that's made of shower gels, body lotions and hand creams with 7 different scents : Dreaming Hawaii, Havana Mojito, Kyoto Elixir, New York Cheesecake, Figs & Fun in Formentera and the last ones released this very summer : Miami Pink Flamingo et Polynesian Experience. Only the first three scents have body mists and yet I'm not disappointed that the other two basic scents don't have body mists : I'm neither interested in a cheesecake body mist nor a fig one. However I really hope Equivalenza will release Miami Pink Flamingo and Polynesian Experience body splashes because those would really deserve it. These body splashes cost €6.50 apiece for 100 mL and the bottle is cute and weird at the same time : I love the fresh, feminine colors and the small drawings and landscapes that remind me of the scent I've chosen but you have to admit the spray looks like a Frebreze/Air-freshener kind of product. That's intriguing but that didn't stop me, right ? Eventually these sprays turned out to be as convenient as the basic sprays since they splash a lot of the body mist in one time so two or three sprays are more than enough. Also if you wish to allow or stop the body mist from being splashed all you have to do is use the little plastic thing right under the spray by turning it to the side or to the front : that's proven very useful especially when I had these all day out with me in my bag. Let's start with the body splash I like the least : Dreaming Hawaii. I merely needed very fresh scents lately when the temperature has gone over 40°C and so I had no patience for a sugary, tropical scent, fresh or not. I don't like flowery scents, I avoid them most of the time as I think most smell like old ladies. Equivalenza changed my mind about cherry blossom with the full-size body mist I talked about this spring but also with this small body splash ! Freshness and sweetness in one bottle, I love spritzing this on these days. 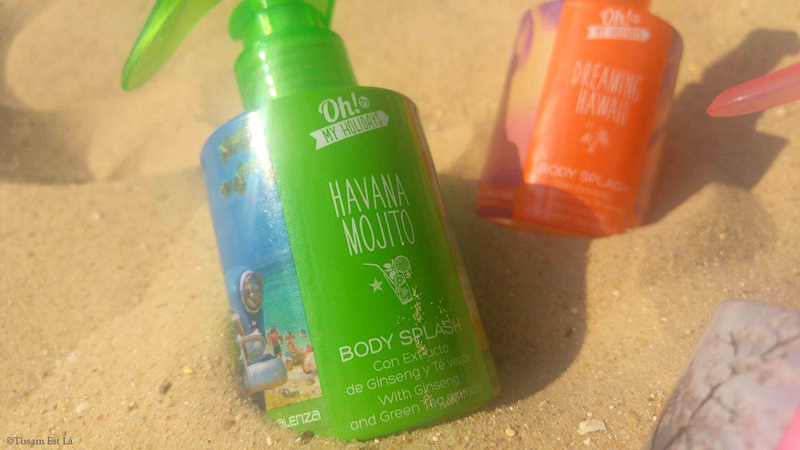 There is no fresher body splash than Havana Mojito : it's a mix of mint, lime and sugar, it smells so fresh and tangy : I've drunk an excellent Virgin Mojito on Tuesday at the Cafe Oz in Paris and posted a pic on Instagram, well, the scent is similar. These are real true body splashes : they're fresh and hydrating thanks to the ginseng and green tea inside but also due to the fact that they don't last for more than 2 or 3 hours unlike their €13.95 Body Mists that smell for hours on end like a perfume. I don't really mind because when I needed freshness, I was really happy to be able to splash them on again and again and smell the amazing scents every time I did. Do you know these Oh ! 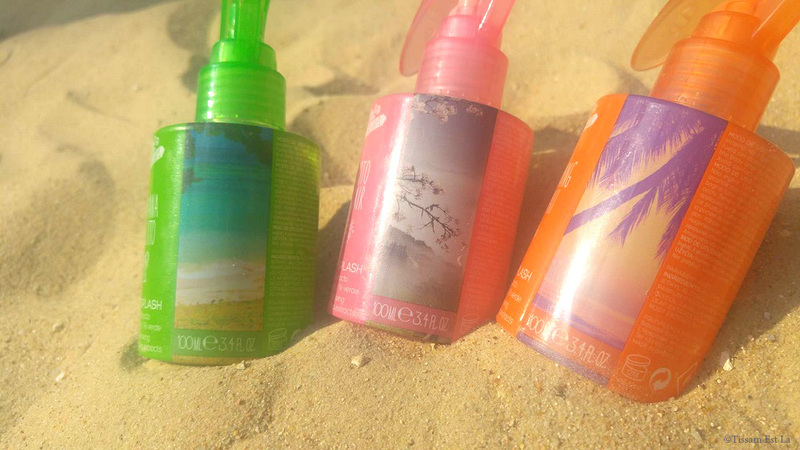 My Holidays body mists from Equivalenza ?